Bathroom Ceiling lights that can be flush or semi-flush mounted to the ceiling in all areas where there is or could be moisture present, so ideal lighting for the Bathroom, cloakrooms and washrooms. We have selected quality bathroom light fittings that are rated for just that - being safe for use in bathrooms. With a choice of chrome, stainless and brass fittings, these can add style to your bathroom suite or cloakroom whether modern, contemporary or traditional you will find a style that suits. Polished and Satin brass finishes are best used in indoor areas only. Not all lighting needs to be rated at IP44 or higher, this will depend on the size of the room as well as the light fixtures position, if you need to know what fittings you can install in a bathroom check out the zone information at the bottom of the page. 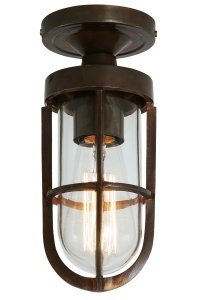 When looking for bathroom lights there are a number of considerations apart from the style you wish to use. Firstly you cannot use a portable light in the bathroom, so no table or floor lamps, for a general overall light use a ceiling light which will usually be flush mounted, ie fixed direct to the ceiling, this reduces any water ingress into the unit, or if you have the space a fixed pendant version will work. We do both using LED or standard bulbs. 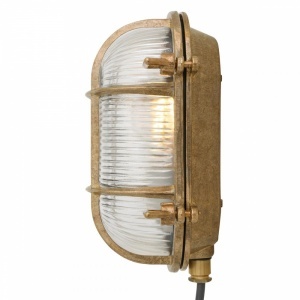 You can also use spotlights if you require directional light or wall mounted bathroom lights for mood lighting. Zone 0 - Inside a Bath or shower - only low voltage (12V) Total Immersion units. 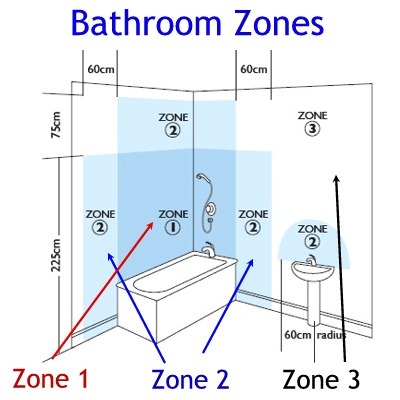 Zone 1 - The area immediately surrounding the bath / shower to 2.25 m above the bath. Any lights in this zone must be IP55 or higher i.e spray proof. Zone 2 - This are must have splash proof lights so IP44 or IP54 or higher.